I have worked with a lot of leagues at this point in my career. I am going to do my best to be clear and articulate and write this blog in an organized fashion (I really need to do outlines like real writers). I am going to mainly talk about the subset. This is the question I’ve gotten from several leagues recently: We have a league that is small already (under 25 who actively pay dues) and our schedule is built around a core of 14 skaters who started the season with us. However, they haven’t made attendance in months, when they do they don’t do the drills, and they belittle the newer skaters who are working to improve. How do we structure our training, and how do we deal with game day rosters when 8 of our 14 have not made attendance and our fresh meat are not yet prepared to skate? If you have a core of fresh meat that are showing up and are dedicated to working hard and building skills and teamwork, why would you tailor your training to girls who aren’t showing up? Create your training schedule (yes, I am a HUGE proponent of building training schedules in 4 week chunks) based around the team you have, not the team you HAD. Maybe this time six months ago you had 9 advanced beginners, 5 beginners, and 2 newborn foals, but now you have 2 advanced beginners, 8 beginners, and 5 newborn foals that show up on the regular. Why would you build your training schedule to include backwards blocking and diamond formations? You need to build the basics first. 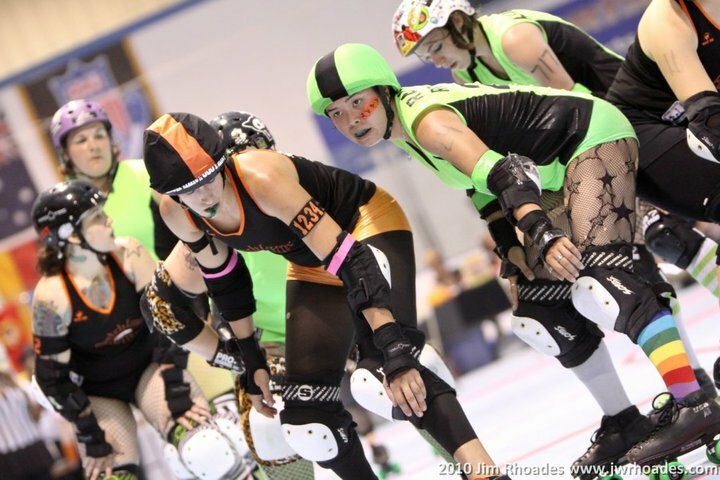 There are basics of roller skating/footwork, basics of teamwork, basics of roller derby, and basics of cross-training. Each needs time and nourishment. When ‘sporadic vets’ decide to show up, they need to fall in line and do the drills of the day and have respect for their coaches, team mates, and the process. If they’re not coming to practice regularly, they probably need the fundamentals as much as the Skater Tots do (especially the fundamentals of teamwork). Packs of skaters are jenga puzzles – if you have one piece that is not in sync, the pack is wobbly. If you have more than one skater not in sync, the puzzle is going to fall. The only way to develop teamwork and trust is through time, experience, and work. Wall work is not a magic thing that just happens for 60 minutes of game play. The teams that can maintain strong, appropriately fluid walls, are the ones who have spent hours drilling it. Texas is Texas for a reason. Really? Why not? (JOKING!!) Honestly though, do you all feel that way or are you just being defensive in the name of what your league has accomplished thus far? Most of the leagues that bring the scenario of a handful of rogue vets to me will present me with “but we don’t want to be competitive, so doesn’t that make a difference?” And then when I dig a little deeper, what I find is that a handful of people don’t want to be competitive. SOME people don’t want the challenge, but there are more people that do want the challenge and the improvement, but maybe they’re used to being quieted at meetings or at practice. Maybe they are the ones being belittled during drills. I rarely meet any skater that shows up 2-3x a week, pays $30+ per month and DOESN’T want to be competitive. The skaters that skate for funsies or as their gym membership are usually the ones that, in the long run, don’t make attendance, don’t come to league events, don’t participate in fundraisers, and therefore should not be making a roster. Yes, even if that skater is ‘more skilled’ than the others on the team. Remember how I said that packs are jenga pieces? I would rather have a team of 9 pieces that know how to skate with one another because they’ve shown up to practice, than a team of 14 pieces that have one or two ‘superstar-exception-to-the-rule’ in every pack. They make each line unstable. They do not know the strategies that have been worked on in practice. They fall out of their lines. They become rogue, big hit blockers (or “Points for the other team” we can also call them), play offense inappropriately, don’t have experience with specific scenarios, don’t know how to communicate or receive communication from the others in their pack, and, in general, cause dissent in the league. Yes. If you have a girl who is ‘super talented’ or ‘vet’ who gets on a roster AND significant play time despite chronically breaking league policy and attendance, how will that bolster team morale? 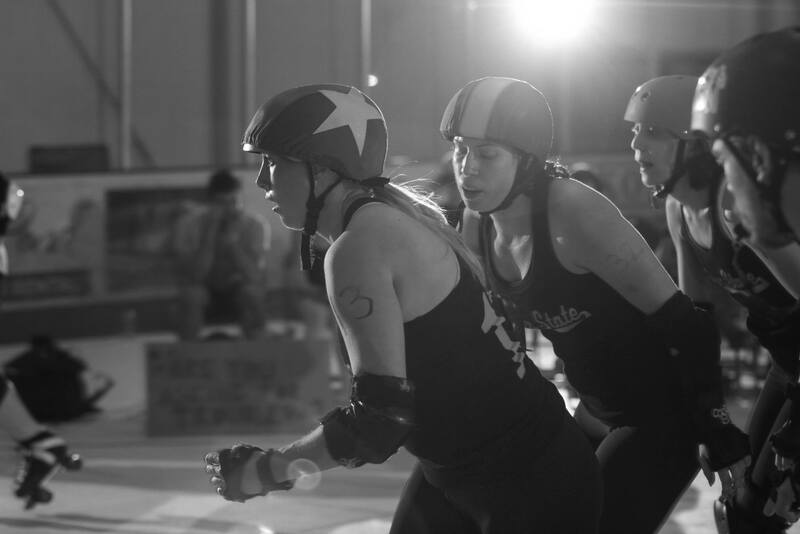 What it shows is that the coaching and training committee rewards talent and time claiming derby girl status. It shows that the coaching does not value sweat, work, and time on the track as a team. Resentment is a cancer. “But we only have 9 players that show up to practice and that qualify to skate! Should we borrow?” No. You play those 9. “But we’ll lose!” Ok. So what? It’s just f***ing roller derby. “But what about our fans?” Will your fans value seeing a consistent group of core skaters whom they can cheer for and get behind (and one day have “I remember when…” moments) or would your fans rather have an ever rotating roster of borrowed skaters in sharpie-written t-shirts? Your team will attract the kind of players that your practice and rosters nurture. If you nurture individual skaters who can come and go as they please, mouth off to coaches, skip drills that they don’t like (though they’ll tell you it’s because ‘it’s too easy), and disrespect their teammates, you are going to continue to attract those skaters that are in it for the derby name, disrespectful, lazy, and unreliable. If you nurture a positive, athletic environment with a schedule and focus; if you nip negativity in the bud and encourage skaters to improve and push themselves, you are going to attract skaters that are willing to work during the paid practice time and invest themselves in the league. If you respect the process of roller derby, you will draw people to you that also respect the process of real, strong, athletic, revolutionary. Ok, conjecture aside. Your league has mostly skater tots (again), some mouthy advanced beginners (who don’t want to admit that they are still beginners), some awesome intermediate-advanced beginners, and a couple orbiters that don’t really fit anywhere. ‘Vets’ are inconsistent at practice. We have issues. What next? Before we get to track time, let’s look at league policy and communication. Confrontation is hard. I have never met so many leagues with so many people in the BoD who do not like to talk about the elephants trampling the team. Call a league meeting. Tell everyone that it is going to be a roundtable discussion on the future of the team, policies currently in place, and policies moving forward. This is not a time for league voting. There will be people who get riled (and you should have a moderator designated who is good at cooling people off and putting out fires to slow the conversation down when people get heated). Have every skater bring a list of no more than five things they would like to address, and have each skater bring a list of at least three things that they feel are going well with the league. NOTE: NO ALCOHOL AT THIS MEETING. After your meeting is done, hand out these cards. You can even go around the room and have everyone pick out one word or phrase that they are going to choose to embody during upcoming bouts or practices. I didn’t have note cards, but you get the idea. Names on one side, positive words on the other! 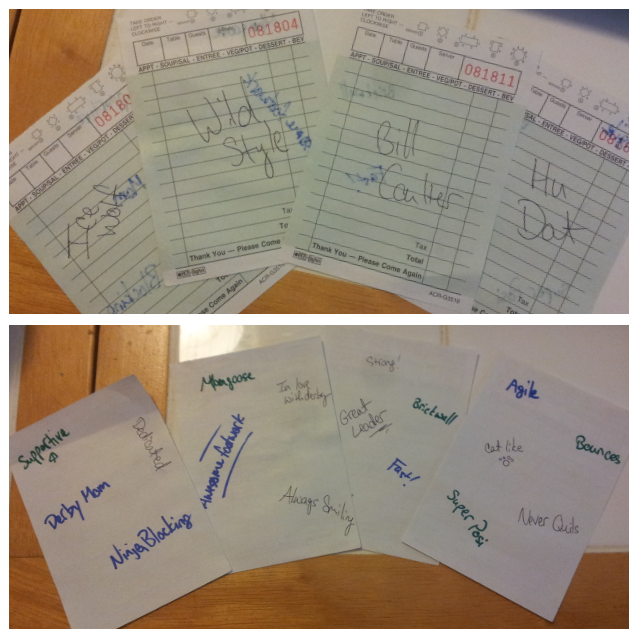 (My writing is terrible, yes that says “Fast!” on Bill Coulter’s card. Move forward from your meeting with the positive idea that despite change being scary, you are going to be steps closer to a more smoothly running league. All the things that people brought to the table? Well the BoD should have brought their own list of topics. Talk about what the BoD has brought to the table, and after the meeting create a master list of things that people want addressed. This is where committees/BoD will focus their efforts in the upcoming weeks. This is not an easy or clean process, but this is step one. You are playing 52 card pick up, and this is stage where you’re taking the pile of messy cards and working to shuffle them back into a one deck that can work as it’s supposed to. COMMUNICATION AND RESPECT is critical for this process. Mediation is necessary. No name calling. Set ground rules for the meeting. If people who show up to the meeting (which you may see faces you haven’t seen for a while) are breaking ground rules set at the beginning of the meeting, the mediator is allowed to throw the Insubordination sign and ask them to leave (or at least to sit outside an cool down for a moment). 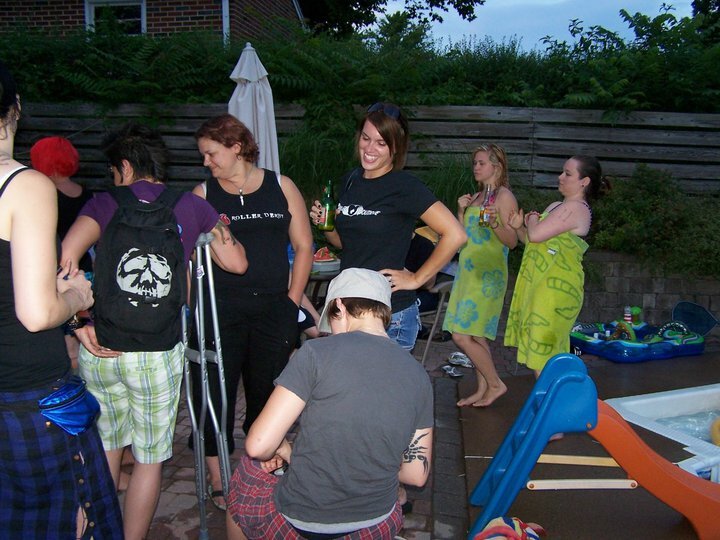 No one in roller derby wants to be angry at their team, no one comes into this for ‘drama’. A league meeting doesn’t have to be ‘drama’, but each team is a business. So think of it as a business meeting. A State of the Union meeting. A “let’s talk about what is good and what is bad and how to move forward from here”. I say this is not a place for league votes because things can get heated, and if you have people showing up that haven’t been there in weeks, they may come in with blinders on. You want people to have a chance to digest. I am also a fan of people having to be in good standing with the league (dues paid, committee hours accounted for, attendance in, etc) in order to be allowed to participate in any league vote. I know. I’m a Maverick. Training different levels at once: This is going to be a separate blog. Once I’ve gotten to this, I realized that I have written so much already, your eyes probably want a break. Thank you for reading through, and I hope you have gotten some good ideas on how to move forward within your league. Any anger, resentment, fracturing OFF the track will be directly reflected ON the track. When I watch a team play, I can almost immediately tell when they have poor league communication, attendance issues, or unchecked egos.